Just over 1000 reviews ago, I had a brief discussion of the Alien vs. Predator movie. From the moment Predator 2 revealed a Xenomorph skull amongst the collection on the Predator ship, the “Alien vs. Predator” concept has been out there, permeating just about every form of media. While the movie was awful (although, it was sweet, sweet bliss when compared to its sequel), there have been a number of far more successful takes on the concept, including Dark Horse’s comics version, which actually served as a heavy inspiration for the movie, but is better in just about every facet. NECA, always anxious for new venues for Predators to release, has slowly been adding various comics-based Predators to their ongoing line. The latest is Broken Tusk, aka Dachande, the comic’s equivalent to the movie’s “Scar,” as a moderately heroic Predator that assists the humans in defeating the Xeno menace. Broken Tusk is one of the three figures in Series 18 of the Predators line from NECA. All three are based on the AvP comic, though somewhat adapted to the more realistic style of the rest of the line, which is sensible. The figure is just shy of 9 inches tall and has 32 points of articulation. 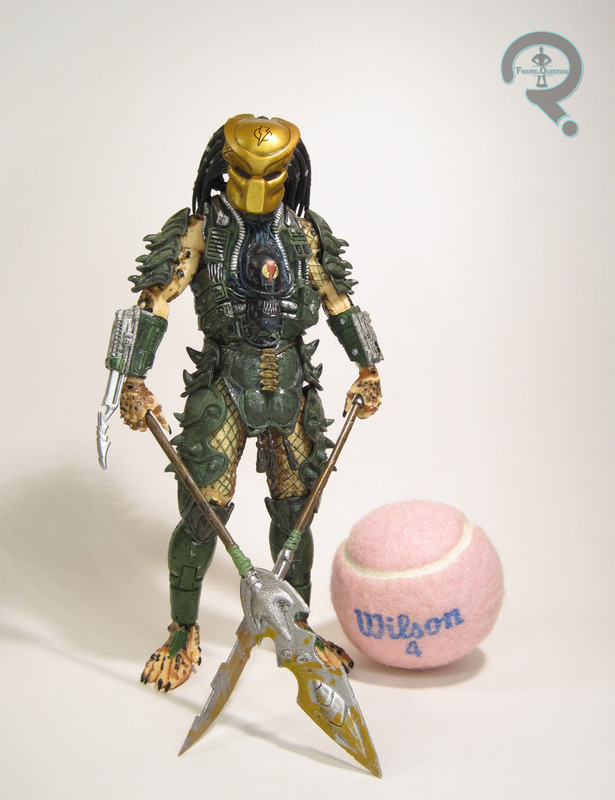 He uses the larger and more posable style of body introduced with Series 14’s AvP movie Predators. It gives them quite an imposing stature, and his articulation makes for a very playable figure. The underlying sculpt is the same basic one seen on the others, with the armored parts being the major change-up. Broken Tusk has a rather unique armor design. In the story, he’s injured during the battle with the Xenos, so the humans have to help patch him up. 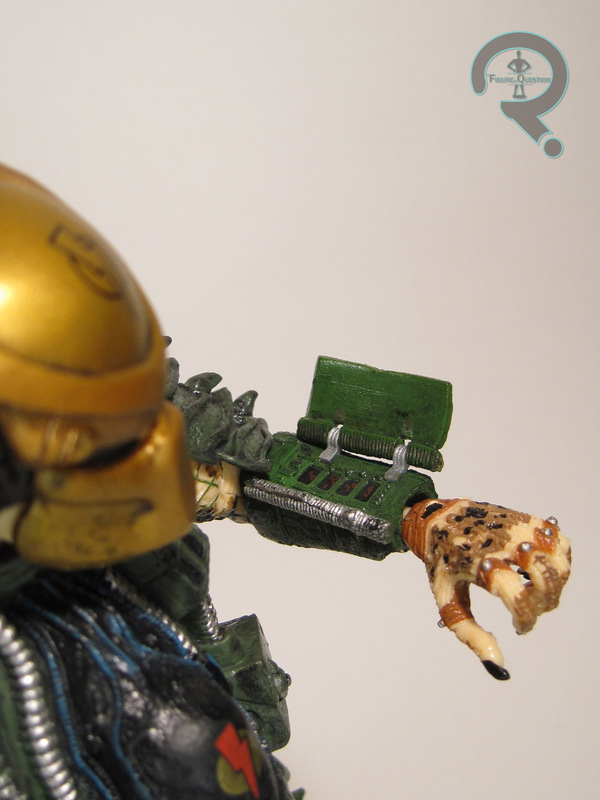 The end result is a blending of the classic Predator aesthetic (including a Jungle Hunter-inspired faceplate), with more utilitarian human tech worked in on the torso, and then a bit of found materials (including a very cool Xeno head). As we’ve become accustomed to with this line, the gauntlets have extending blades on one side, and a fold-out panel on the other, which is always a fun feature. As amazing as the sculpt is, what really sold me on this figure was the paint scheme. In the comics, he’s colored in a more traditional Predator sort of sense, with lots of browns and greys, making him as a whole look quite similar to the standard Jungle Hunter. 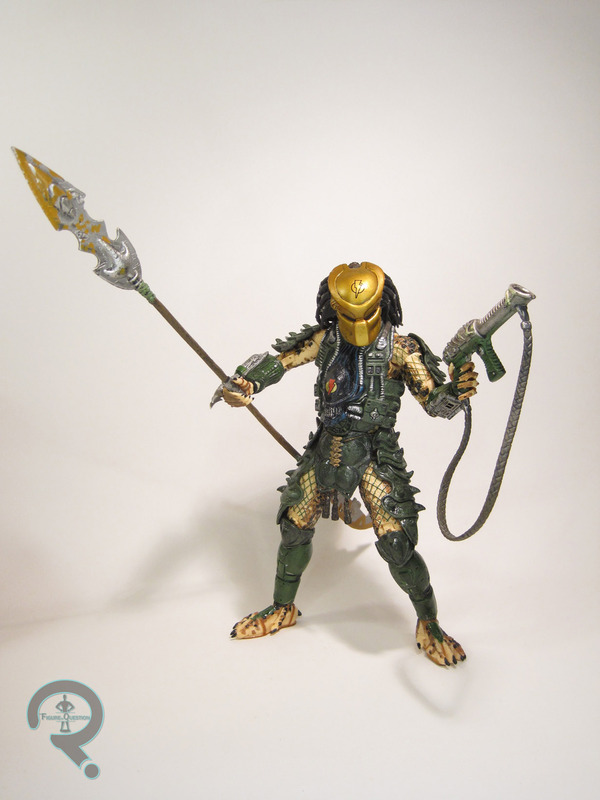 Of course, that describes a lot of the NECA Predators so far, so this guy would have been just one fo the pack. As cool as the sculpt may be, with those same colors, he might end up unfortunately forgettable. So, instead, NECA’s played up the human-ally aspect of the character, and given him a color scheme modeled after the Colonial Marines from Aliens. It’s pretty darn cool, and I love have they’ve even made the patterns on his skin look like the camo pattern from the Marine uniforms. It’s definitely very clever. 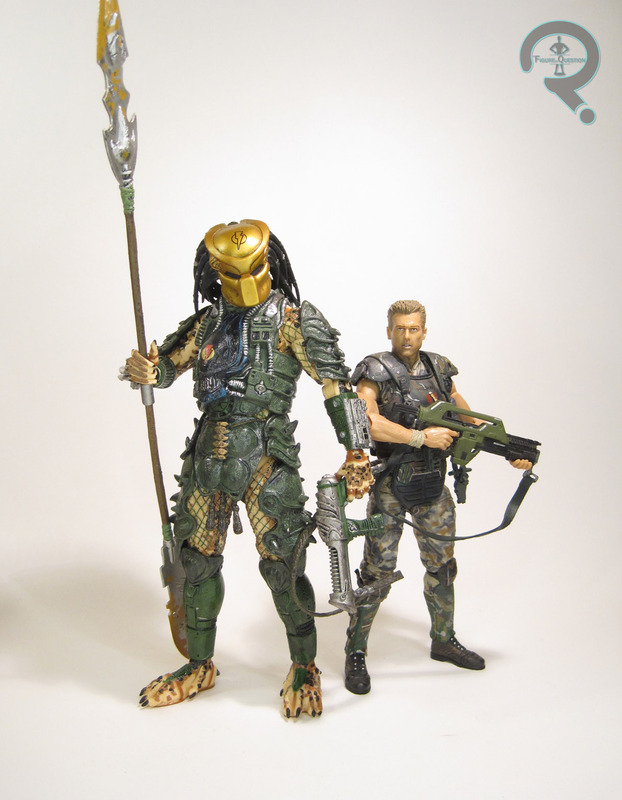 Broken Tusk’s accessories further the melding of the styles, with his more Predator specific two-part staff, and a more human-inspired rifle as well. Both weapons are very nicely sculpted and well fit to his hands. I’m a more moderate Predator fan, but I’m a huge Aliens fan, so anytime NECA melds those two lines, I’m on board. As soon as this guy was shown off (TWO Toy Fairs ago), I knew I wanted one. It’s been a long wait for him, long enough that I’d thought maybe he just wasn’t coming. But then, Series 18 just sort of dropped in my lap, and boom, here he was. Fun’s a word I used a few times in this review, and it’s an apt description for him. I just really like him, in both concept and execution, and he’s a fantastic accent piece for my rather expansive collection of Colonial Marines. I picked up Broken Tusk from my friends over at All Time Toys. If you’re looking for cool toys both old and new, please check out their website and their eBay Store.